If a thumb top strap is required by your police agency for plain clothes use this Bianchi holster is the right choice. Police gear from Bianchi is durable and of the highest quality. The leather Shadow 2 Bianchi Holster is molded and precurved for maximum carrying comfort, draw angle and concealability. A classic 3-belt slot design allows this Bianchi holster to be worn strong side or cross draw carry. Fits belts 1-3/4" wide. Open muzzle holster design. Don't settle for an inferior brands, CopsPlus only sells the highest quality police gear because we know your safety depends on it. It was no fault of the product or the web site but I was looking for a right hand cross draw holster. This isn't quite what I was looking for. The other issue is that this was for a Glock model 40. One thing I forgot about is the Glock 40 has interchangeable grips. If you use anything but the standard grips makes closing the thumb strap very hard. Once again no fault of the product or the web site it is just something to keep in mind. Just received holster, perfect fit for my Taurus 82, excellent quality. Nice enough holster, but not for what I needed it to do. Good quality, good retention, great buy. Good holster for the price. Very stiff and took more effort to break it in than other brands. Well made, simple and comfortable. I expected better quality & better fit. Disappointed. Excellent Holster. Good strong leather quite thick and durable. Should provide many good years of service. I expect it will get even better as it is "Broken In'. Delivery time was great. Ordered for my Taurus PT 111 G2. Second holster I have ordered from Cops Plus. Both are great fit and well made. This order was originally for a different holster that was back ordered, Cops Plus sent me an email to see if I wanted to wait or change the order. Glad I changed, I like this holster better, great customer service. I will remain a repeat customer. P.S. the holster break in video was very helpfull. Great product, Bianchi is never disappoints. Although I haven't received this one yet, I've had other Bianchi Shadow holsters over 25 years or so, and they are well fitting, sturdy, no nonsense, and comfortable gun leather. Perfect fit. Great for concealment. Good, quality construction, simple and safe and has been around in one form or another for a long time. Nice fit, works just fine, I like the versatility of it and the retention snap. 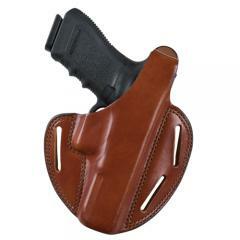 Very well made, high quality holster. Great quality and perfect, snug fit.